Karate belts are important in the world of martial arts. It is not for decorative purposes nor is it used to hold the uniform up. It is used to determine the level of expertise of the men and women practising martial arts. The color of the belt is the way to rank martial arts experts. Not only that, it is The most generic colors are white and black – with white being the symbol of beginners and the black as the symbol of a true expert. Dr. Jigoro Kano, the Japanese founder of the Modern Judo, came up with the ranking system that is now being followed by the karate belts. The color belt system was intended to show the progress of the student in martial arts. In the 1880’s the first “black belts” were awarded to the skilled students who earned them. 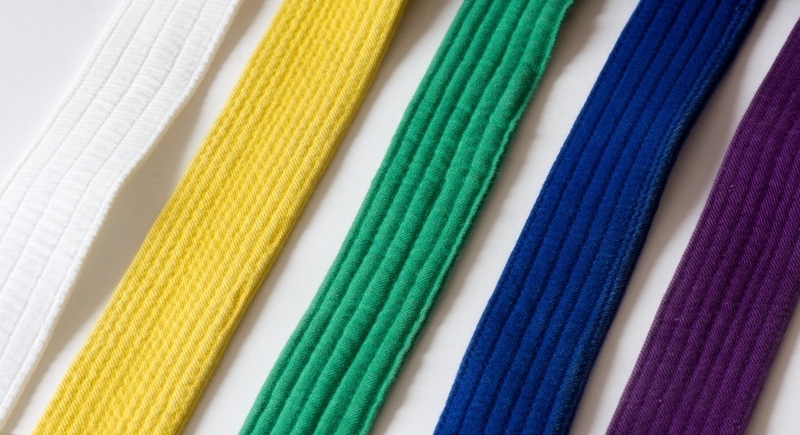 Since Judo influenced a lot of the other martial arts, the colored belt ranking system was adopted by them as well. Dr. Kano’s friend and founder of Shotokan Karate, Gichin Funakoshi, adopted the ranking system and other philosophical concepts. Byung Jick Ro, the founder of Soo Moo Kwan (Modern Taekwondo), was the student of Gichin Funakoshi. When he got his black belt in 1939, he implemented the same color belt ranking system in taekwondo. 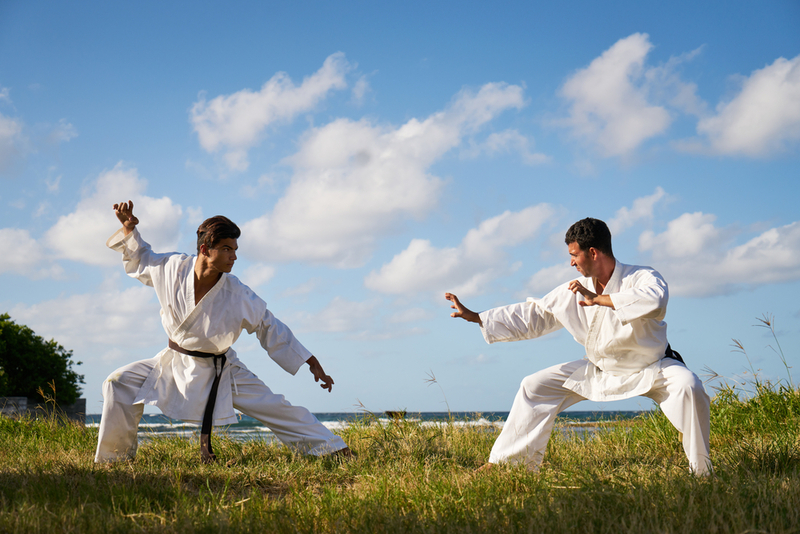 There are a couple of myths surrounding the way the colors of the karate belts changed as the student progressed into the form of martial arts. It is believed that students began with a white belt. As they trained and fought to improve their skill, the white belt became stained with sweat, blood, and dirt. For martial arts experts, this is completely false. Cleanliness is strictly implemented in a traditional Karate and Judo dojo. No student will be allowed to come in with a stained white belt. When all of this started, Japan and Korea were poor countries. That means they had to dye the belts time and again as the student advances to a new level. This is why the progression of colors grow darker as the skill increases. So what is the meaning of the different colors of the karate belts? White belt. This color represents birth or the beginning. The wearer is sometimes seen as a seed too or a Beginner that is searching for knowledge of the Martial Arts. Yellow belt. This color represents the first rays of the sun that shine on the seed as it beginning a new life. Orange belt. This color represents the stronger power of the sun as the growth of the seed intensifies. Green belt. This color represents the growth of the seed – specifically when it sprouts from the earth and starts to grow as a plant. Blue belt. This color represents the blue sky – and the plant that continues to reach for it. This also refers to the light that also feeds the plant. Purple belt. This represents the changing of the sky from dawn to light – just like the student going through a change and a deeper understanding of the martial arts. Brown belt. This represents the way a seed ripens as it matures and gets ready to be harvested. It means the student is starting to show the fruits of the hard work and training. Red belt. This represents the red heat of the Sun as it feeds the growth of the plant. This also means the student is more cautious with their knowledge. Black belt. This represents darkness that is beyond the Sun. It does not mean death but the beginning of a more profound and deeper knowledge of martial arts. This indicates the student is now ready to plant seeds and teach others. While the colors of the karate belts indicate the progress of a martial arts student, it is wrong to think that black belts are masters or white belts know nothing about the art. The truth is, those who hold black belts simply mean they are competent in the basic technique. But that does not mean the learning stops. For instance, in Taekwondo, it takes 2 to 4 years to get a black belt. But that is only for the 1st Dan Black Belt. You still have to reach the 5th Dan to be a master of Song Moo Kwan and 8th black belt to be the Grandmaster.